Lake Nanita is located 10.8 miles from North Inlet Trailhead on the west side of Rocky Mountain National Park. It lies at the head of an isolated valley framed by Ptarmigan Mountain (12,324’) and Andrews Peak (12,565’). This long but moderate trail follows North Inlet Creek 7.45 miles before splitting off on a strenuous 3.35 mile climb to the lake. Camping is not permitted at Lake Nanita or nearby Lake Nokoni, which limits traffic and gives each an undisturbed feel. The trail begins on a level dirt road across private property to the edge of Summerland Park (1.2 miles : 8,530’). It narrows onto single track and arcs NE around large meadows partially veiled by thin bands of timber - ideal habitat for seeing wildlife. Social trails branch down to viewing areas of the voluminous cascade; exercise caution when scrambling about this oft-slick area. The trail continues above the falls around a large meadow, another great place to step out and scan for wildlife (4.0 miles : 8,950’). Mild grades expedite travel along the creek through damaged swathes of forest, with more frequent intervals of healthy spruce and fir deeper in the backcountry. The main trail continues on steep, short-leg switchbacks over Nokoni with aerial views of the basin and valley below. It crests on the shoulder of Ptarmigan Mountain (10.35 miles : 11,064’), then descends ruggedly to the edge of Lake Nanita (10.8 miles : 10,780’). Steep walls frame the west shore, but the long east shore is accessible with some crafty maneuvering. Terrain is varied and uneven, with many interesting nooks, side ponds and outcrops to explore. The North Inlet Trail is part of the greater Continental Divide Trail, which runs over 3100 miles from Mexico to Canada. It's also part of a 17.2 mile thru-hike route across Rocky Mountain National Park from Grand Lake (west) to Bear Lake (east). The trail is easy-moderate to the Lake Nokoni - Lake Nanita junction. It then climbs 1550' in just 2.75 miles from the low point over North Inlet Falls to the high point between Nokoni and Nanita. The North Inlet Trailhead is located on the west side of Rocky Mountain National Park, just off West Portal Road on the north side of Grand Lake. "This is a tremendous hike. Very long, but not technical or too strenuous. 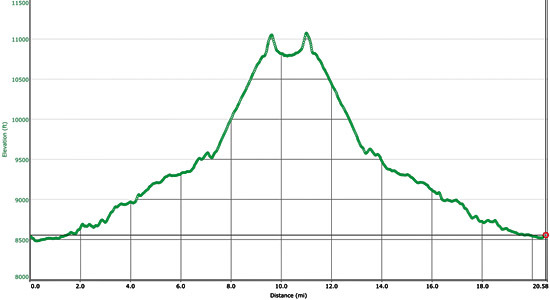 Fairly easy the first 7 miles or so, then the elevation gain begins, but it's never too steep. We had to deal with some snow to Lake Nokoni, but not too much. It added to the scenery near and at the lake. We had to break trail a little to get to Lake Nanita. While one can glimpse it in the distance through the trees after heading down from the ridge between the two lakes, it does take a little while to actually get to the shore. We had it all to ourselves, and it was magnificent. Lingered for a while before making the long trek back. Encountered a moose near where the cascades flow down from War Dance Falls. My friend thought it was another hiker and said, "Look, another hiker...wait, that's not a hiker, that's a moose!" He was a big boy with a huge rack, so we backed down the trail a little to get behind some trees. He didn't seem to care about us a whit, but we waited until he moseyed on by before proceeding." "My 1st of two backpacks on North Inlet Trail was in 1992. Hiked up and camped at Footbridge camp site when the only crossing over the river was a flattened log. Balancing a full pack was a challenge. At that time my son was 8 and the 65 year old Pastor from our church was leading the charge up the trail. I was 30 LBs over weight and not in any shape to be in this situation. Guess who's at tail end begging for a rest every 1/2 mile. Now flash forward 8 years during which I changed my life with a diet and exercise program, lost the 30 LBs. I'm planning my son's Scout Troops Hiking,biking and rafting trip to Colorado. I picked the same trail and this time went from Grand Lake over the Continental divide down to Bear Lake. Guess who's leading the charge up the mountain now. I'll never forget the 16 year olds at the end of the line begging me to take a break. PS: Lakes Nokoni and Nanita are spectacular,"
"This is one of the most pristine areas in the country. Large Green Back Cutthroat trout lounging at the surface, in a magnificent lake setting. The hike is a little strenuous, but so incredible once you reach your destination. Both lakes are magnificent, but Nanita was may favorite because of all the visible fish. They are just gorgeous. If you go, you will be very pleasantly surprised. Make sure your camera is in perfect condition. You will definitely want to share your adventure with friends and relatives. Enjoy."